Product #31319 | SKU PPA500BT | 0.0 (no ratings yet) Thanks for your rating! The 6-channel Behringer EUROPORT PPA500BT features quality sound and Bluetooth wireless capability in a compact, portable suitcase-style 500-watt PA system that is designed to be fast and easy to set up. 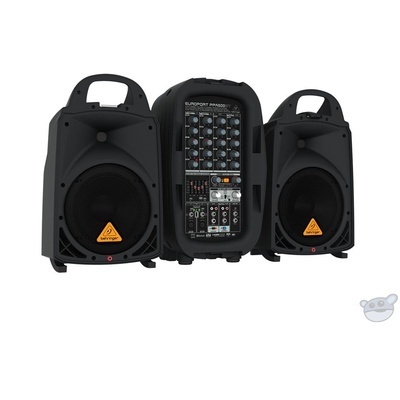 Intended for parties, corporate events, seminars, aerobics, working musicians and more, the EUROPORT PPA500BT comes with compact speakers that each contain an 8" woofer and a 1.35" tweeter. It also has inputs for 2 microphones with high-quality mic preamps and switchable +48 V phantom power, plus it allows you to wirelessly play your iPod, iPhone, iPad or any other MP3 player via Bluetooth connectivity. The unit also features a KLARK TEKNIK effects processor with 100 presets including reverb, chorus, flanger, delay, pitch shifter and more. The FBQ Feedback Detection System is designed to reveal frequencies that are causing feedback so they can then be attenuated with the built-in stereo 5-band graphic AEQ. The EUROPORT PPA500BT is also "wireless-ready" for use with the Behringer ULM digital wireless microphones (not included). The package also comes with a BEHRINGER XM1800S microphone, mic clip and 6 m cable.